A year and a half ago I read the book "The Last Valentine" by James Michael Pratt. This was SUUUCCHHH a good book! I cried at the end! It's about a newlywed couple who are married on Valentines' Day, only to say goodbye to each other one year later on their wedding anniversary when the husband goes off to fight in WWII. He becomes missing in action. It tells of what happens to him, and what happens 50 years later. I HIGHLY recommend it! "True love is like a metal tested in a fire. Fires of adversity surround us daily. Are we to love when it is merely convenient? Like gold or silver, which very hot fires must heat to purge them of impurities, love must be thrust into the fire from time to time to make it purer, stronger, and more resilient. And in the same way, love shines its brightest right out of the flames. The beauty of the rose and its fragrance? There's another example of the quality that I'm trying to explain to you. The fragrance is found in the blossoms of the rose. The blossoms are found after the rosebud opens. Notice the stem on the rose bush. Notice that the bud doesn't even open until the thorns, those prickly things that can stick you and cause you to bleed, are fully formed. It's as if the rose bush is saying 'No! You can't have my beautiful flowers and the sweet smell of their petals. If you try to take one, I'll hurt you!' Is it worth risking the thorns to have the rose? It's where the blossoms dwell. Above the thorns, you will find the prize. So it is with life. The thorns, the prickly problems of life, cause us to strive to rise above them and then, as we do, we learn. We learn to exercise true compassion, true kindness - or the thorns, if we let them, cause us to brood, to mourn over our trials. Then we plant the seeds of bitterness, hate, and ruin - weeds. We may reach up for the rose or down to the weeds....the weeds in life that tangle us, strangle us, and cause us to lose hope." The Hallmark movie aired on Channel 2 Sunday January 30th. 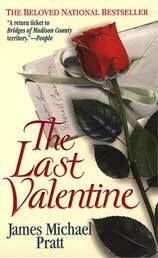 The movie is called "The Lost Valentine", even though the book is called "The Last Valentine ". It stars Betty White and Jennifer Love Hewitt. One thing they left out of the movie was that when they found his body and belongings, they found a valentine he had made to give her when he returned. It had a long letter, which is posted above. He always promised he would return to her on Valentines Day. Another thing different in the book than the movie is when he is shot. He is not just "out looking for the enemy". Him and the locals discover that the American troops are coming up the jungle, and Neil knows that they will never make it past a certain point. The enemies are always hiding in the trees, and there is no way for the American troops to know that. So Neil and the locals come up with a plan to take over that part of the jungle, so that when the American troops arrive, they will not be blindsided. Yes, Caroline Thomas dies at the end. In the book, Neil's body is returning to the states via airplane, but Caroline goes to the train station instead, where she last saw him. As she is sitting there, she has a heart attack, and she sees him come for her in the distance. She dies, becomes young again, runs to him, and they fade off into the distance. Very different from the ending in the movie. I love when my favorite books are made into movies! Watch the movie, go read the book, and then come back here and post your opinions, and if you liked it as much as I did! It's a great book for this time of year, and I am especially excited to watch the movie tonight! Read more about my favorite books at Michelle's Favorite Books. I haven't read the book but I saw the TV movie tonight and the ending is ambiguous. It shows Betty White's character in the present day outside watering roses, she sees a bloom on the one her husband had planted and her grandson told her was dead, then we see her imagining the past, and a young uniformed man hugging her from behind and dancing. She is smiling, then a tight shot to her hand dropping the water sprayer. In the present day the young couple cavort laughingly in the water from the sprinkler, similar to how the couple from 1945 did. Did Betty White's character die? (I just posted the letter from the book into the body of this post). Lots of beneficial reading here, thank you! I had been checking on yahoo when I observed your post, I’m going to add your feed to Google Reader, I look forward to additional from you.